The scientific name of the hawthorn is Crataegus monogyna, Crataegus comes from a Greek word meaning ‘strong’ while monogyna means ‘one ovary’ and the resulting single stone in the fruits, or haws, is a distinguishing feature. 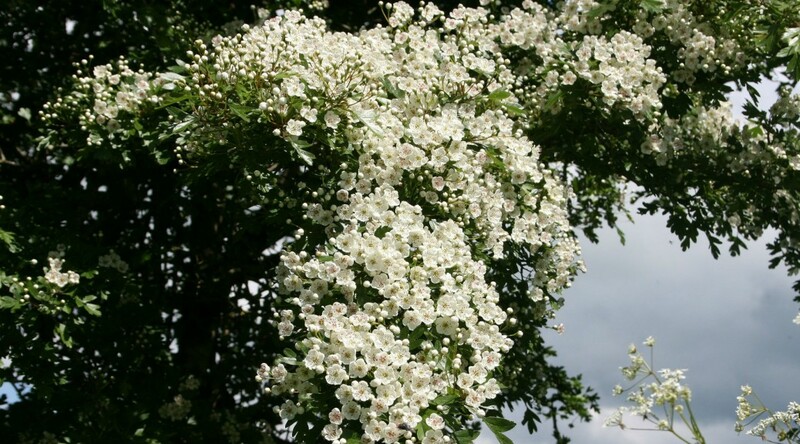 The hawthorn has many other names including Sceach Gheal, Whitethorn or Quickthorn and May, Maybush or Mayblossom. It is a small tree with an untidy open crown of spiny twigs which, in ideal conditions, can occasionally reach as much as 10m in height but is generally much less. The bark is a smooth grey-green when young but in characterful old age it is more grey-brown, sometimes reddish, wrinkled and ruggedly ridged. With increasing age the trunks,may develop deeply fluted, buttressed bases. The leaves are dark green with 3 – 7 lobes while the flowers, which appear in May – June, are strongly scented and white or pink with prominent pink or mauve anthers. The scarlet haws are popular with birds in the winter. To the beekeeper, hawthorn blossom is known as a potential source of one of the finest of honeys and a rich supply of cream coloured pollen at the height of the brood rearing season. However, the beekeeper also knows that, unfortunately, the honey potential of hawthorn is seldom realised and only becomes apparent in its pure form once every five or six years (2014 was brilliant). Various studies have failed to pinpoint the exact reasons for this but it seems that good years occur when the weather is fine, still and humid. In dry, windy years the flowers are probably wind pollinated in which case nectar will not be produced. The trunks of the hawthorn are too small and twisted to be of much use in today’s timber industry but the wood does have properties that were once sought-after. Slow growth bestows a close grain to the wood and this made it a candidate for veneer and cabinet making. The close-grained timber was also valued in the printing industry where it could be made into blocks for wood engraving. Its strength allowed it to be used for mallet heads, tool handles, mill-wheel teeth and the ribs of small boats. It was also used for fencing stakes and makes excellent firewood and charcoal. The hawthorn is known to have some medicinal properties and infusions of the fruits and flowers are considered by herbalists to be effective in the treatment of nervous disorders, hypertension and insomnia, blood pressure and arteriosclerosis, while a poultice of leaves and flowers may help to draw splinters. Hawthorn is also rich in folklore and it is thought to be unlucky to cut lone trees, especially those growing on raths or hills, as these are thought to be fairy trees. Consequences may range from haunting or paralysis of the culprit to sickness in his animals. A 1995 survey estimates a total hedgerow length for the Republic of 327,258 km, 98% of which would contain hawthorn to varying degrees. The majority of Ireland’s hedgerows would have been planted between 1750 and 1850 when common lands were enclosed to form fields and to exclude the poor. In 1873 barbed wire was invented in America and the rejuvenating practice of hedge-laying to mend gaps was gradually replaced by this cheaper repair method. Irish hawthorn hedgerows are now showing their age and all too often they tend to consist of a ragged line of spindly, ivy-topped trees – festooned with wire and tottering in the breeze. The fate of these derelict hedges tends to be grubbing out and replacement with electric or barbed wire fencing, which is a shame as many of them could be restored by laying. But dereliction is not the only problem. In 1999 between 390 and 420 km of hedgerow was lost to housing developments alone – if the losses through dereliction and modern agricultural practices are added, then the total annual loss must be very much greater. Now here we are 15 years on and if that figure is correct we’ve lost another 6,000km! The bottom line of all this is that our hedgerows are dwindling and in the absence of serious planting or rejuvenation they will soon disappear altogether – a depressing thought. Conserving Hedgerows. The Heritage Council, Kilkenny, Ireland. Raven, P.H., Evert,R.F. & Eichhorn,S.E. Biology of Plants. Fourth Edition. Worth Publishers Inc. USA. Previous PostCarniolan BeeNext PostBee Basics – Which Beehive?